At first glance this doesn’t look a lot different from some of the other photos I have here. This photo tells a story, or in some way has a hidden story within. As I was going through photos to post here I ran across this one. As I sometimes do, I realized I shot it all wrong to tell the story. They say a picture is worth a thousand words. That might be how many it takes to tell you this story. Mostly because I shot this photo all wrong. I was after a shot of a small town street. A common stand in the middle and look down the street shot. And I got it. Sadly. It could have been much more. The setting is Sherman, SD, just after 5 p.m. It is the 22nd of June in 2012, so that makes it a Friday. 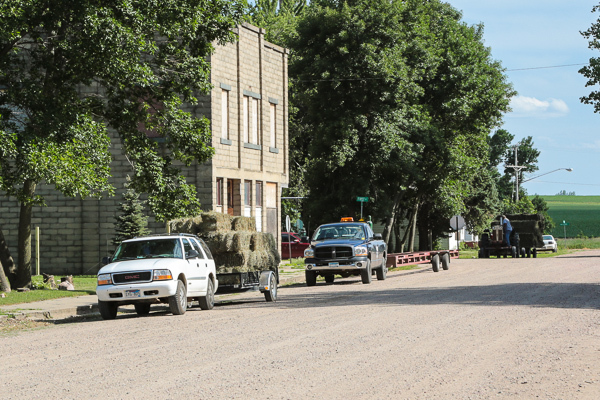 This is a typical small town out in farm country. It’s slightly, only slightly more country than most. It has gravel streets and when you park, you mostly just make sure you’re out of others way. A lot of times what parks on these streets can’t be angle parked to well. So there are several vehicles parked on the side of the street. Two of them loaded with fresh hay and one pulling a trailer. On another day of the week these vehicles would be on their way to their destination. But, it’s Friday in Sherman and that means something. What you don’t see, on the right side of the street there is a bar and grill that has a steak fry on Fridays during the summer. Judging from the amount and variation of vehicles I saw, the steak fry means get there early, get there what ever way you can, because the food is good and all your friends are there. There were tractors, pick-ups, cycles, cars, farm trucks, you name it all parked around the steak fry. It was only ten past five and it was already getting busy. It’s funny when you don’t see the picture at the time, but after time has passed the photo jogs you’re memory as to what else was going on that wasn’t in the photo and then you realize that what was going on would have been the better photo. This entry was posted in Uncategorized and tagged community, copyright ryan ware, small town, small town life. Bookmark the permalink. I totally understand where you’re coming from with this post. Hindsight. Yet you captured a rural scene and then used your words to tell the entire story. That works for me.